The Aurora Ceres Partnership Ltd are recognised as thought leaders and food industry experts. As such they are regularly approached to contribute to numerous publications, books and journals and are to provide comments as industry experts by media organisations such as Food Navigator, Food Manufacture, and the BBC. Look out for further contribution from food industry experts in forthcoming publications: On Board Hospitality, World of Food Ingredients and Food and Drink Technology and Food Matters Live Table Talk. Latin America can learn from healthy reformulation efforts of Europe and USA – Food Navigator-LATAM April 2018. Key Ingredients for Clean Label Success: Download the output of the Ingredion round-table sessions, ‘2020 The Future of Simple, Natural and Clean Label Food’, here. Adopting New technologies – Nutraceuticals Now. Winter (March) 2016. Private label trumps brands over negative feedback – but can brands afford to become complacent? Retailers pledge to change misleading products as 13,000 Dutch consumers vote for the worst offender of 2015, but as branded manufacturers have remained silent experts warn they should not become complacent. Risotto rice is targeted by fraudsters Food fraud is a going trend, and other premium products are always going to be the focus of potential fraud and adulteration. Should companies use social media to deal with a food scandal? Food Industry expert, Steve Osborn discusses the importance of management of the social media flurry in the event of a crisis, especially when that food safety crisis has been publicised by social media. Sustainable sourcing starts with better use of your own company’s waste Steve, our food and drink industry expert discusses the issues with food manufacturing waste with Food Navigator reporter Nathan Gray. Antibiotic-free – Is this the next ethical food label? The rise of concerns around Antibiotic use in food is discussed by Steve, our food industry expert. Is Organic the best start to the day? Steve Osborn discusses how breakfast could be an ideal route into habitual organic foods, but it may be at risk from the rise of ‘on the go’ breakfast options. “Road-Mapping for NPD”, February 2015. “NPD: Things to consider”, March 2015. Steve has recently written a chapter on “Labelling Relating to Natural Ingredients and Additives” in “Advances in Food and Beverage Labelling” (Berryman 2014), published by Woodhead Publishing, London. 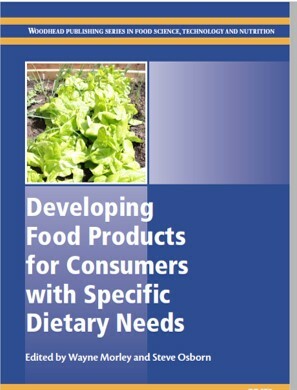 Steve has authored a chapter on “Food Wastage” for the forthcoming publication “Encyclopedia of Food and Nutrition” from Elsevier Ltd to be published in 2015.